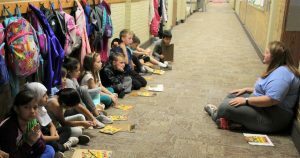 Today’s visit to schools to learn more about how GCS students grow and change took us to Parkside Elementary, to a couple of 2nd grade classes. 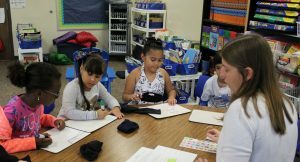 First we visited Ms. Maria Wenger’s classroom, where they were working on math. 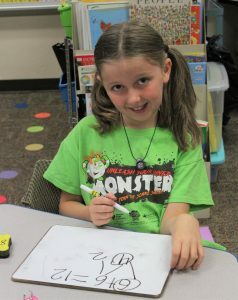 The class was learning to “make a ten” in order to help them learn addition in a new way/with a new strategy. (See the example below.) First the students look at the equation, 8 + 9 =. 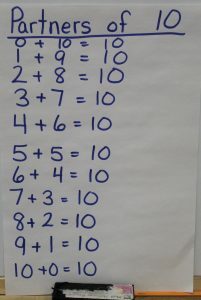 Then they decide which number is the largest number or “the number closest to ten” (9). Then they break up the other number (8) into two smaller numbers that equal that number (8), making sure that when they do that, one of those numbers (7 and 1) combine with the larger number (9) to equal ten. 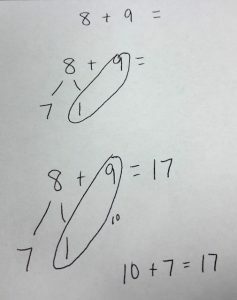 Once the students have circled the two numbers that “make a ten”, then they simply need to add the leftover number (7) to get the answer to the equation (17). 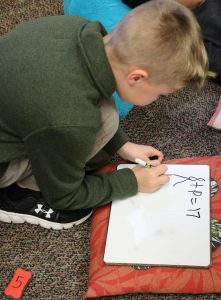 When asked about this way of doing addition, Ms. Wenger said that she “did not learn math in this way either, and it was hard for me to think this way at first.” But, it gives students a strategy to use instead of using their fingers to count. 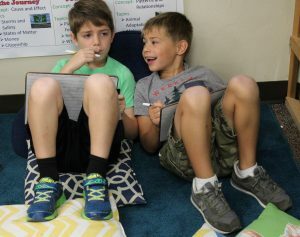 When it seemed like most of the students had gotten the concept, Ms. Wenger dismissed the students to practice writing and solving equations with a partner. 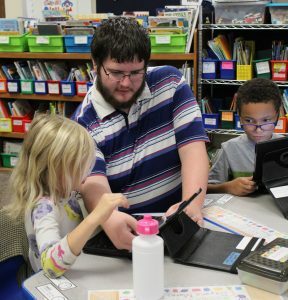 Several students who needed more help with the concept stayed with Ms. Wenger for more practice and instruction. 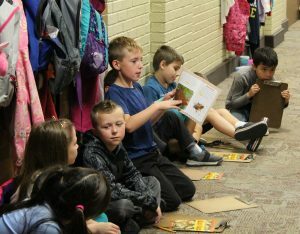 The students then broke up into different groups (combining with Mrs. Laura Green’s 2nd grade class). 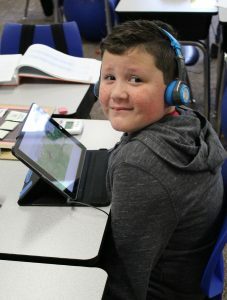 Some students were practicing reading with Ms. Wenger, some were working on iPads with the Technology Resource Coordinator (TRC), and some were working on “glued sounds” with Mrs. Green. 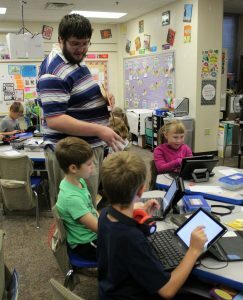 The students working on the iPads were also given keyboards, so that they could work on their keyboarding skills. 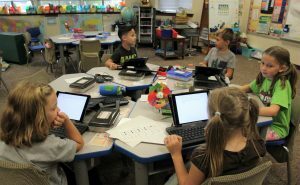 According to the TRC, today the students would be “exploring Google Docs and how to use them.” The students were asked to open a new document, to name the document, set the font, and then begin to write something about the title they had selected for their document. There was a lot of enthusiasm about personalizing the font, and some students spent extra time getting it just right! 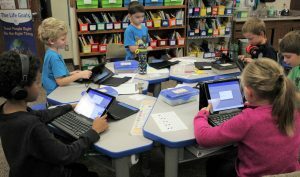 But soon they were all practicing their keyboarding skills as they wrote about their subjects. 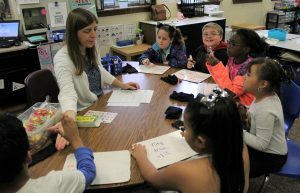 In Mrs. Green’s room, there was a small group of students working with the teacher on making words with “glued sounds”. 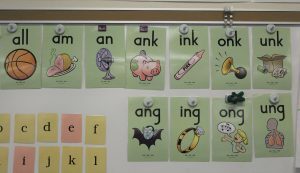 (According to the board in the classroom, their glued sounds included all, am, an, ank, ink, on, unk, ang, ing, ong, and ung.) Mrs. Green would say a word, the students would repeat the word, and then they would sound out the word by “tapping it out”. 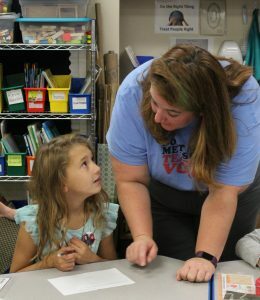 For example, they were working on the word drank, so Mrs. Green helped the students hear the D sound, then the R sound, and then ank (one of their glued sounds). 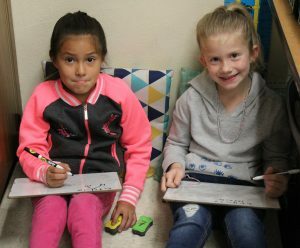 Once they had practiced it a couple of times and could hear all of the sounds, the students wrote the word on their white boards. 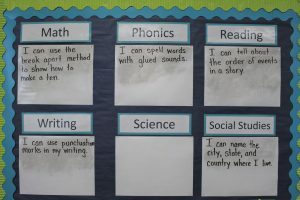 Mrs. Green had the concepts that her class is currently working on listed on a bulletin board in her classroom, making it easy for students to see their current concepts and to know their goals. Mrs. Green also had her Class Promise listed. 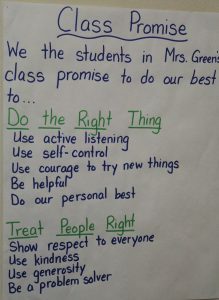 Class Promise: We the students in Mrs. Green’s class promise to do our best to Do the Right Thing: use active listening; use self-control; use courage to try new things; be helpful, and do our personal best and Treat People Right: show respect to everyone; use kindness; use generosity; and be a problem-solver. 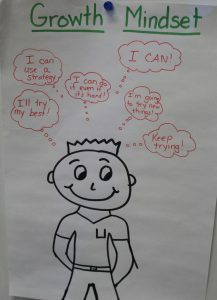 Through other signs in her room, Mrs. Green also encourages her students to have a growth mindset, to keep trying, and to persevere, one step at a time! 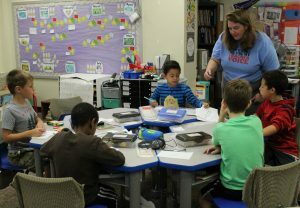 Next, Mrs. Green dismissed some of her students to Spanish class, explaining that not everyone goes to Spanish classes. 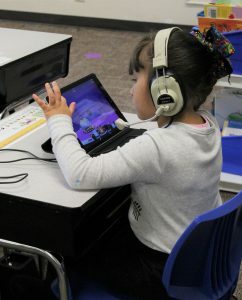 However, “students can take Spanish if their parents sign them up to participate.” While some of the students were gone, Mrs. Green worked with small groups while the rest of the class worked on RAZ (Reading A-Z) on their iPads. 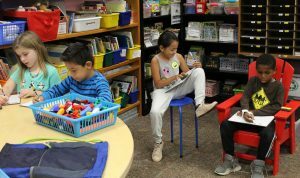 The students were reading books such as Harriett Tubman, Animal Dads, Soccer, The Foods We Eat, The Time of Day, Friends in the Stars, How the Mice Beat the Men, and Penny and the Rude Penguin. 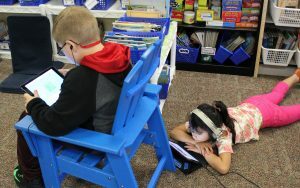 Some students were reading the books themselves, and some were having the book read aloud to them and were following along as the iPad highlighted the words being read. 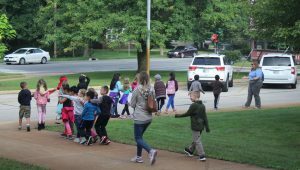 And before we knew it, we looked outside and saw Ms. Wenger’s class leaving for their field trip to the public library. We hope that they did indeed have a good time! 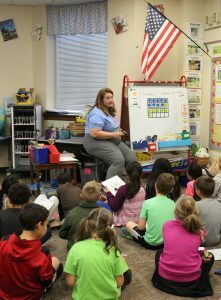 Thank you Mrs. Green, Ms. Wenger, and Parkside 2nd graders! 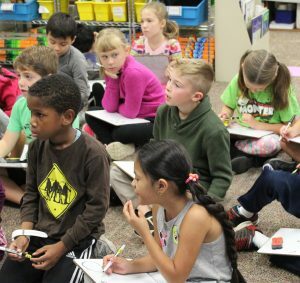 We see that 2nd graders work on math and writing just like 1st graders, but we also see that 2nd graders are learning to ask questions for further understanding, and are using deeper thinking to understand new concepts. 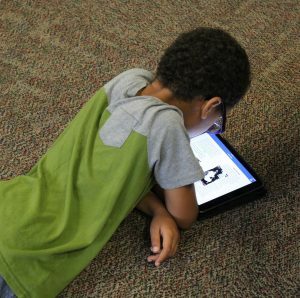 With each new grade, GCS students are moving forward in their educational journey. They are growing every day!